The Sharp SuperSteam+™ Built-In Wall Oven is the start of a cooking revolution. The innovation is simply that steam can be hotter, cook better, and promote healthy living. 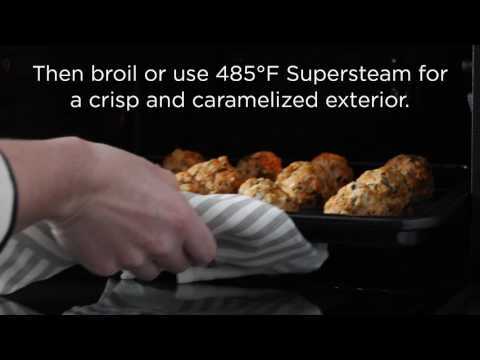 Simple steam only reaches 212°F, but the SuperSteam+™ also creates super-heated steam at 485°F. Meats and proteins will brown. Sugars will caramelize. You can grill without smoke, roast without drying and your food is crispy on the outside, tender and juicy on the inside. And don’t forget, the Sharp SuperSteam+™ built-in wall oven is also a powerful convection oven with even heating for superior baking. That’s three ovens in one! The bright, beautiful and easy-to-read touch screen display keeps the control at your fingertips and gives you expert guidance and built-in recipes. Cleanup is a breeze with two, preset cleaning modes. There is even a sterilize option for canning jars, lids and small utensils. The oven comes built-in ready with a sleek trim kit to make installation elegant and simple. The removable reservoir means no special plumbing or wet wall installation is required. And with a common 120V power requirement, you can just plug it into a regular outlet and you're ready to go. 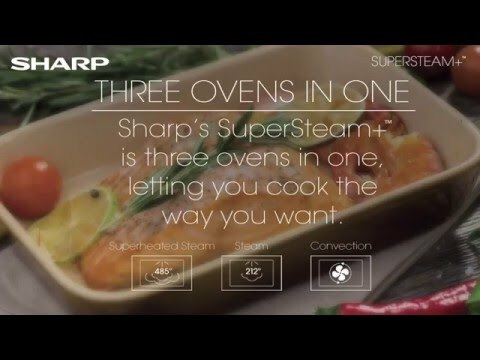 With approximately 2 million steam ovens sold, it's easy to see why home cooks throughout the world trust Sharp. Letting you cook the way you want. The oven's interface gives you expert guidance to make healthy and delicious meals you love. Modern, Premium Stainless Design Makes The Supersteam+ The Perfect Showpiece For Your Modern Kitchen. The oven comes built-in ready with a sleek trim kit and pairs elegantly with the Sharp Microwave Drawer. For questions, service, manuals and more, we have lots of ways to get answers. Please choose from the support files available here. Visit our blog, Simply Better Living for new recipes, tips and ideas. You can also signup for our newsletter to have our free-forever newsletter emailed straight to your inbox! For more information and information on other products please visit our full customer support site. Some products qualify for an Extended Warranty. Click to see if an extended warranty is available for your product. Shipping Weight: 15.55" x 12.01" x 9.45"
30" x 19.8" x 15.65"
33.8" x 23.7" x 22.8"